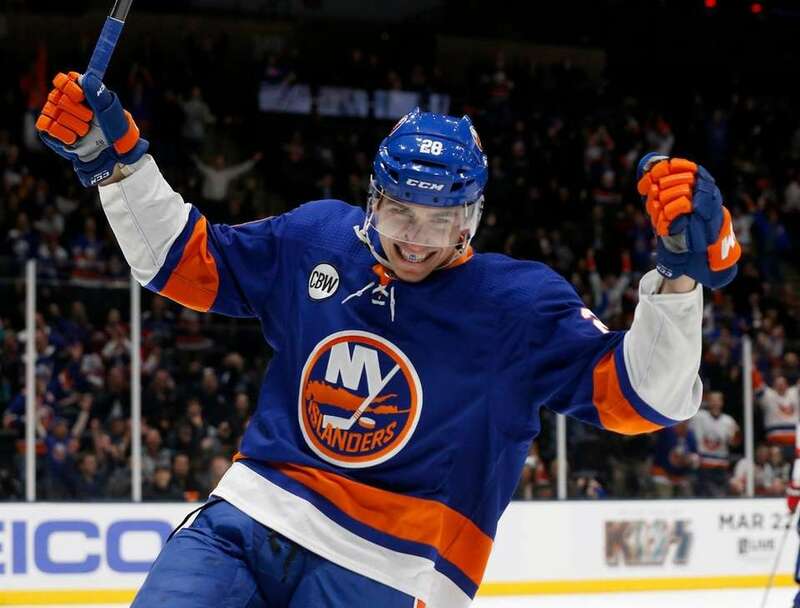 The Islanders routed the Devils, 4-1, at NYCB Live’s Nassau Coliseum on Thursday, Jan. 17, 2019. Robin Lehner of the New York Islanders makes a save during the second period as Matt Martin defends against Blake Coleman of the New Jersey Devils at NYCB Live’s Nassau Coliseum on Thursday, Jan. 17, 2019. Robin Lehner of the New York Islanders defends the net during the second period against the New Jersey Devils at NYCB Live’s Nassau Coliseum on Thursday, Jan. 17, 2019. Michael Dal Colle of the New York Islanders celebrates his first-period goal against the New Jersey Devils at NYCB Live’s Nassau Coliseum on Thursday, Jan. 17, 2019. Michael Dal Colle of the New York Islanders celebrates his first-period goal against Mackenzie Blackwood of the New Jersey Devils at NYCB Live’s Nassau Coliseum on Thursday, Jan. 17, 2019. Anders Lee of the New York Islanders celebrates his first-period goal against the New Jersey Devils at NYCB Live’s Nassau Coliseum on Thursday, Jan. 17, 2019. 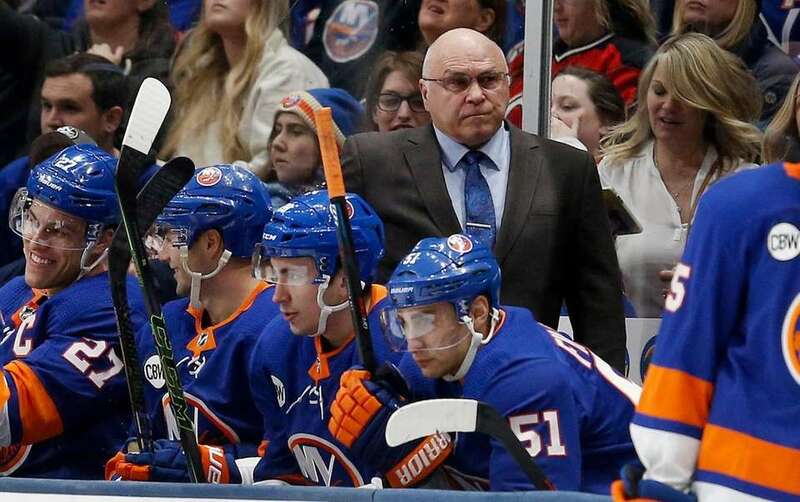 Head coach Barry Trotz of the New York Islanders during a timeout in the first period against the New Jersey Devils at NYCB Live’s Nassau Coliseum on Thursday, Jan. 17, 2019. Anders Lee, right, of the New York Islanders celebrates his third-period goal against the New Jersey Devils with teammate Josh Bailey at NYCB Live’s Nassau Coliseum on Thursday, Jan. 17, 2019. 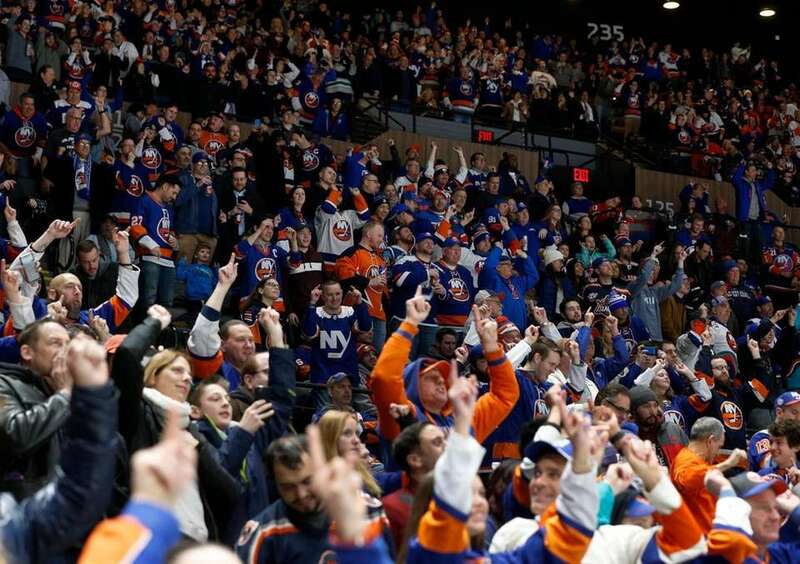 New York Islanders fans cheer after a first period goal against the New Jersey Devils at NYCB Live’s Nassau Coliseum on Thursday, Jan. 17, 2019. Leo Komarov of the New York Islanders battles for the puck during the third period against Will Butcher of the New Jersey Devils at NYCB Live’s Nassau Coliseum on Thursday, Jan. 17, 2019. Mathew Barzal of the New York Islanders is stopped on a breakaway during the third period by Mackenzie Blackwood of the New Jersey Devils at NYCB Live’s Nassau Coliseum on Thursday, Jan. 17, 2019. Brock Nelson of the New York Islanders battles for the puck during the first period against Damon Severson of the New Jersey Devils at NYCB Live’s Nassau Coliseum on Thursday, Jan. 17, 2019. Cal Clutterbuck of the New York Islanders tries to control the puck during the first period against Mackenzie Blackwood of the New Jersey Devils at NYCB Live’s Nassau Coliseum on Thursday, Jan. 17, 2019.